The optical repeaters/isolators adds another 50 feet to an RS232 run while it isolates the TD, RD, RTS, and CTS channels. All four channels support speeds up to 115.2 kbps. These units work in an industrial environment with DIN Rail mounting. 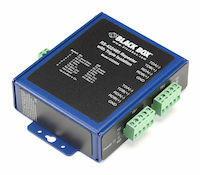 Doubles the allowable range of RS-232 transmissions up to 100 feet (30.4 m). Rugged, IP30-rated metal case for panel mounting. Tolerates temperatures ranging from -40 to +176º F (-40 to +80º C). Designed to withstand both shock and vibration. Boasts 2-kV triple isolation for safeguarding data and equipment. Tolerates temperatures ranging from -30 to +185º F (-40 to +85º C). 2G shock and 3G vibration protection. DIN rail mountable with optional adapter. 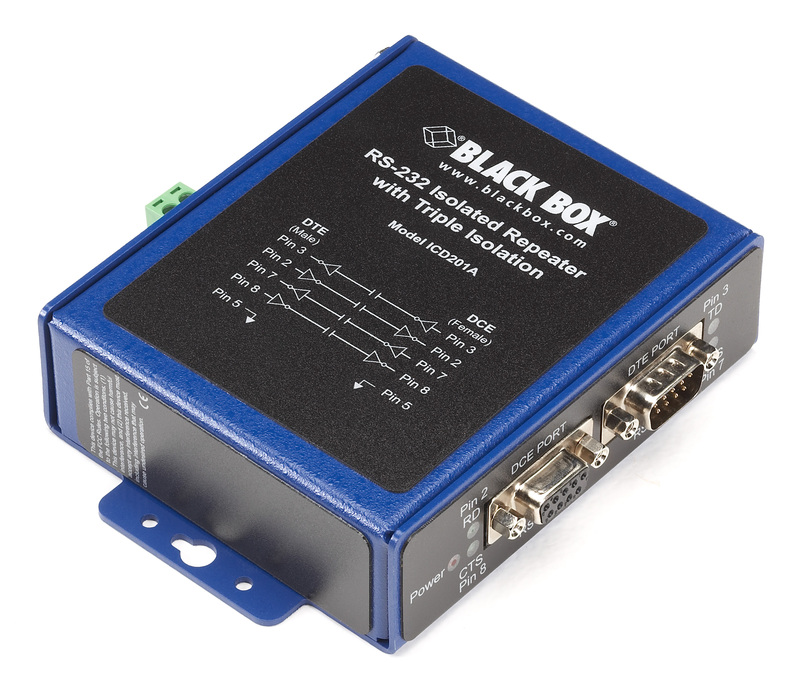 This heavy-duty Industrial Opto-Isolated RS-232 Repeater doubles the maximum allowable distance permitted under the RS-232 specification for longer serial transmissions. Encased in an IP30-rated enclosure, the repeater's been put through some of the most exacting tests in the industry. The high-grade repeater meets the requirements of two standards that make it suitable for electrical substation installations—IEC 61850-3 and IEEE 1613—specifications that are more stringent than NEMA TS1/TS2 requirements for transportation applications. 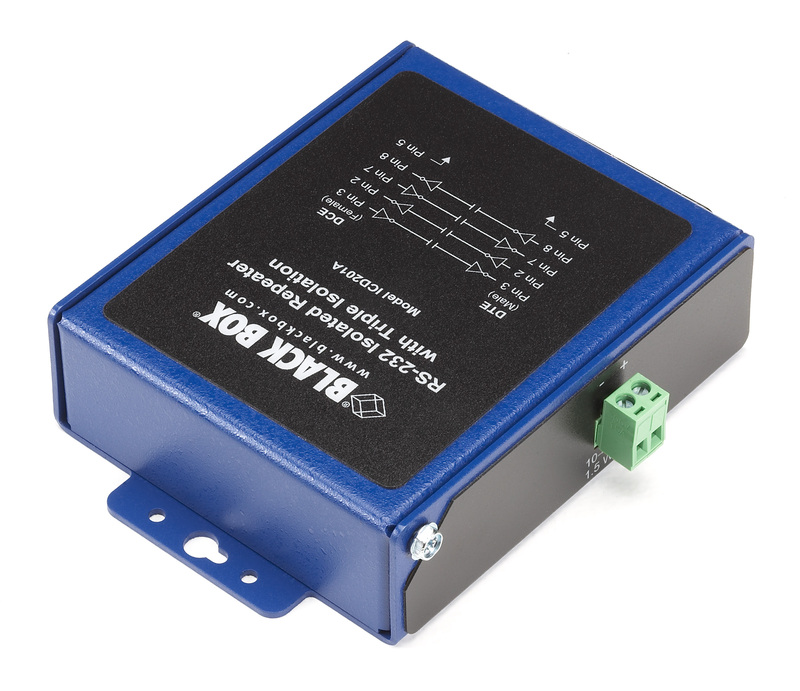 The Industrial Opto-Isolated RS-232 Repeater features 2-kV triple isolation, protecting equipment as well as data from rogue currents and ground loops. It provides powerful isolation on both DTE and DCE ports, and with additional isolation on the repeater's power supply circuits, you're given a third degree of protection. This level of protection helps prevent stray currents from disrupting important RS-232 communications, such as those in factory, engineering, military, defense industry, or utility applications. By isolating voltage anomalies, you stand a much better chance of preventing a surge from shutting down an assembly line—or your entire plant. Simple to set up and troubleshoot. Its rugged, panelmount case is designed for easy integration with control panel or other industrial equipment. Simply connect data cables to its DB9 female connector (DCE) and its DB9 male connector (DTE). For power, it has a removable, two-position terminal block that accepts 10-48 VDC power from any external power source (not included). The repeater also supports loopback tests for troubleshooting. Through DCE and DTE port cable connections, you can use Hyperterminal® or a similar program to perform these tests. Weight 0.5 lb. (0.2 kg) * See our PS1003 power supply, available separately. The Async RS232 to RS232 Repeater DB9 to DB9 comes with a standard 5 Year Double Diamond™ Warranty (Standard) already included.